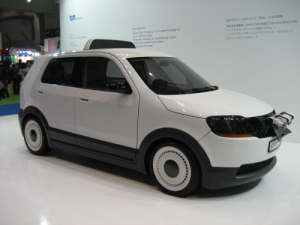 3A Composites Core Materials has supplied AIREX® T92 PET sandwich core material for the new taxi EVA, designed by TUM CREATE and unveiled at the Tokyo Motor Show 2013. The electric taxi has been designed for use in tropical megacities and has used materials to reduce the weight as much as possible and improve insulation. Responding to the demand for environmentally friendly transport in tropical megacities, Singapore’s Nanyang Technological University (NTU) and the Technische Universität München (TUM) teamed up to form the TUM CREATE research program aimed at developing a specialised electric taxi for the needs of tropical megacities. Research has covered topics such as electrochemistry, electric vehicle batteries, embedded systems, air conditioning, simulation and modeling as well as infrastructure. EVA was presented at the Tokyo Motor Show in November 2013, featuring a range of 200 km and a super-fast battery charging time of just 15 minutes allowing the car to be driven quasi non-stop through two 12-hours shifts a day. The design team made extensive use of sandwich composite technology, both to save a maximum of weight and to improve the vehicle’s insulation in order to further reduce the car’s energy use for air conditioning. Recyclable PET-based AIREX® T92 foam core material was chosen for its low resin uptake, high mechanical properties and cost efficiency and it was applied in many places throughout the entire composite body, such as roof, bulkhead, floor and component carrier system as well as the large battery housing. The composite parts were produced through infusion, using glass fibre and polyester resin. A PET foam core was used where a sandwich structure was employed.